What is CVC 22349(a) Speeding? A VC 22349(a) Charge alleges that you drove over 65 miles per hour on a highway. 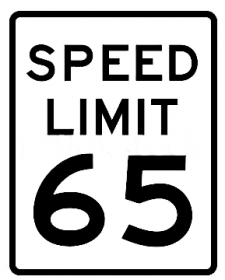 Under the California Vehicle Code, the speed limit on every highway or freeway is 65 mph unless it’s posted higher (ie 70 MPH). The term “highway” under the vehicle code refers to all publicly maintained streets. The term “Freeway” refers to a divided highway. You were the driver of a motor vehicle. Your vehicle’s speed was greater than 65 MPH. Usually, the central issue is whether the method used to calculate your speed (ie RADAR, LIDAR, airplane, bumper-pace or visual estimation) is sufficient and proper. What Are VC 22349(a) Penalties? If you are found guilty or simply pay the fine for a VC 22349(a) the DMV will place a point on your record for 3 years. Insurance companies then take you off “good driver discount” status and increase your premium 20% or more. Over the course of 3 years you may pay $900 to $4,000 more for car insurance just because of a point. Fines are another penalty imposed by the court. The amount of fines depends on the speed over the speed limit for which you are convicted and if you have prior moving violations. Fines typically range between $350 and $600 for the speeding charge alone. What Can California Ticket King Do? If you received a ticket for Speeding Over 65 MPH, hire California’s best ticket law firm. We will substantially increase the odds of getting your ticket dismissed, fines reduced, or DMV points avoided. To learn more about our procedures and how we can fight your traffic ticket, call the California Ticket King, PC at 877-985-0002 or email our attorneys at info@caticketking.com.